Submitted by Mason Hoberg on Sep. 27, 2017. When it comes to acoustic instruments, a huge part of your tone is decided by the strings you use. The gauge, the material they’re made from, and their design can all transform your tone; for better or worse. So to make the most out of your instrument, equip it with the best sounding acoustic guitar strings - check out the recommendations below! Before we jump into the main article, according to our findings most musicians prefer light or medium gauge guitar strings; other gauges were part of our research but didn't quite rate high enough to make our recommended list. If you prefer heavier gauge strings, check out a heavier gauge model from one of the series we’ve recommended below. 94 out of 100. Incorporating 275+ ratings and reviews. Though Martin is known more for their guitars than their strings, Martin has actually been making their own strings since 1970. The strings are made from phosphor bronze, so they’re going to give you the warm tone and smooth highs you expect from the material. 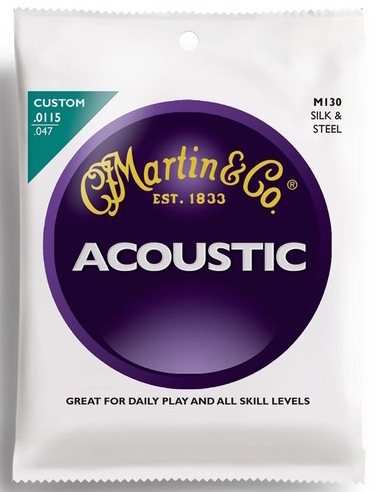 The cool thing about Martin’s strings is how affordable they are. They generally retail for a bit under Ernie Ball’s strings, and they don’t have any of the quality concerns that come with that brand. Their strings are always of a really consistent quality, so even though they’re really affordable they should perform the same as any other set of strings. Like any other string, there are musicians who don’t like Martin’s acoustic strings. However, the reviews for this set are overwhelmingly positive. This set currently has a 4.8 out of 5-star rating at one of the major retailers, with 85% of those reviews being a 5-star rating. Like the M540 series, the Martin MSP3200 SP 80/20 series has been really well received. In fact, the reception they’ve gotten definitely makes them one of the standout strings in their price tier. Even better, their arguably one of the most affordable sets of 80/20 guitar strings available. The main thing you need to know about these strings is that they’re made from an 80/20 alloy, so they’re going to be really bright compared to phosphor bronze. This isn’t a bad thing, but there are some musicians who don’t really like 80/20. 80/20, when used on your average dreadnought, creates an almost twangy tone. It’s great for fast strumming and bluegrass/Americana lead, but the tone isn’t as balanced as phosphor bronze. So in some situations 80/20 strings can sound really thin when played solo, even if they do perform really well when played in a band. Like the Martin MSP3200 set above, the D’Addario EJ19 is made from 80/20 bronze. All of the same things apply here that applied with the set above. If you get this set of strings, expect to end up with a very bright and cutting tone. An important thing to know about these strings is that they’re a “Light Top/Medium Bottom”. Essentially, this means that the set is a mixture of a light gauge and a medium one. So this means that the thinnest strings are going to be easier to play, while the thicker ones are going to be harder to fret. This is actually great if you’re looking to play lead on an acoustic guitar. Because the thicker strings are heavier you’ll still be getting plenty of volume, and the lighter gauge of the high-E, B, and G strings facilitate playing lead. The Martin MSP3050 SP 80/20 Bronze Custom Light set is a great fit for musicians looking for a cutting and bright acoustic guitar tone. 80/20 bronze, also known as brass, produces a really bright and lively acoustic guitar tone. This is likely why it’s so widely adopted in bluegrass and genres derived from it. Though to be fair, these strings will perform pretty well in any upbeat genre. The gauge of this set is also pretty versatile. Lighter gauge strings are usually a better fit for fingerstyle and/or lead playing, but they will do alright for moderate amounts of strumming. With that being said, if you mainly strum open chords, a thicker gauge of string will give you a fuller tone and more volume without being too much harder to play. They have a very warm and rich tone, and because of their construction (a combination of steel and nylon) they’re significantly easier to play than bronze strings. Because it takes less force to push the strings down, silk and steel guitar strings are great for fingerstyle and folk musicians. However, the main thing to be aware of with these strings is that you’re not going to get as much volume as you would with standard bronze strings. So, if you plan on playing along with other musicians unplugged these strings may not be the best fit. Though, if you’re planning on playing amplified there won’t be much of a difference. 95 out of 100. Incorporating 1500+ ratings and reviews. 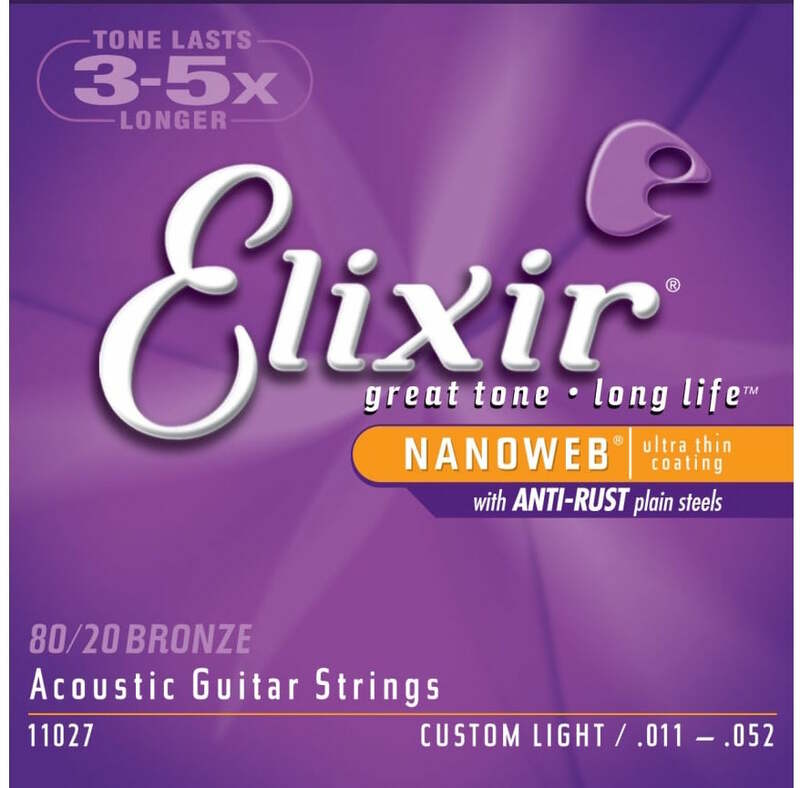 Elixir was the first company to bring a coated string to the market, and in the years since they’ve maintained a reputation for producing excellent strings. A fun fact about the company is that they actually got their start producing push-pull cords for airplanes, and coated those to increase their longevity. Than one thing led to another and a musician on the team tried doing the same thing to his guitar strings. Elixir strings have a really distinct tonal profile. Unlike other manufacturers, Elixirs 80/20 strings are arguably the most balanced strings in their line. Because of the coating used, Elixir strings are very warm sounding by default. Some feel that their phosphor bronze strings can make some guitars sound muddy, but this isn’t quite as dramatic when the coating is used on 80/20 strings. This gauge in particular is great for fingerpickers or those of you looking for a lighter gauge, but if you’re more of a strummer this set may be a bit too light. The D’Addario family has been involved in making strings since the 1600s, though D’Addario as a company has only existed since the 1970s. Before that, the family either imported strings from their relatives overseas or made strings under different names on behalf of other companies. The interesting thing about this set is that it actually uses D’Addario’s NY steel. NY steel is a proprietary high-carbon steel which is reportedly more durable than the steel the company usually uses in their strings. D’Addario also claims that NY steel gives their strings better tuning stability. Apart from that, the strings are representative of what you’d expect from medium gauge coated phosphor bronze strings. It’s a very warm sounding set of strings, though they aren’t muddy sounding by default (if paired with the wrong guitar they may sound a bit muddy, but you’re experience will vary). Though not as well known as D’Addarios, Elixirs, or Ernie Balls, Vibe Strings are starting to gain traction among acoustic guitarists. 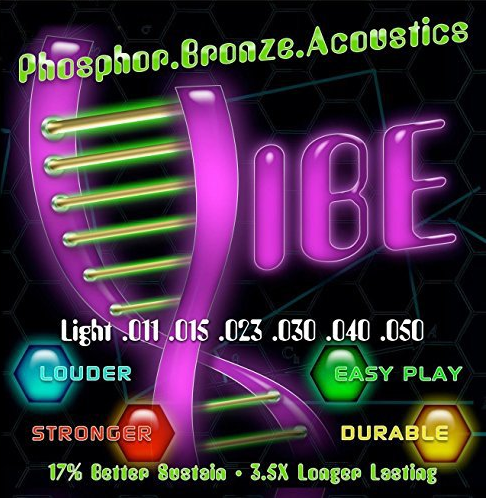 Vibe strings are made in smaller batches than their competitors which, while this does make them a bit more expensive, helps to increase their quality control. Each string in the pack is also vacuum sealed, which will help them last longer inside of the package. Something to be aware of with these strings is that they’re more comparable to a custom light set. The difference isn’t going to be huge, but it will be noticeable. This also means that while they’ll be great for fingerstyle, they may not be the best fit for strummers. 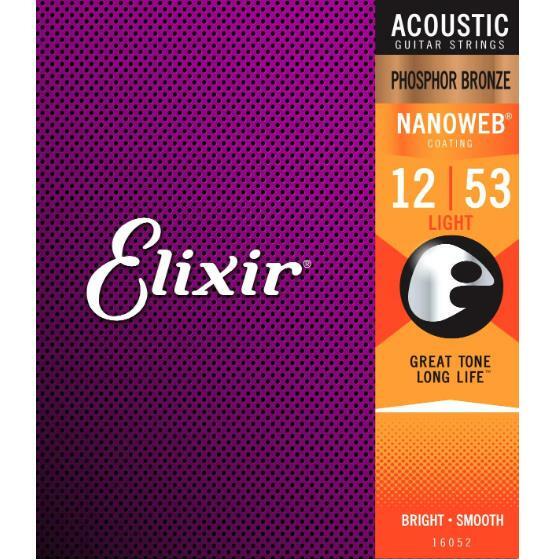 Judging by the user reviews, these strings seem to be a bit brighter than other phosphor bronze strings. Part of this could be due to the thinner gauge used, but the possibility exists that these strings are just particularly bright. This isn’t a bad thing, it’s just something to be aware of. D’Addario’s coated strings have been very well received, the EXP series especially so. 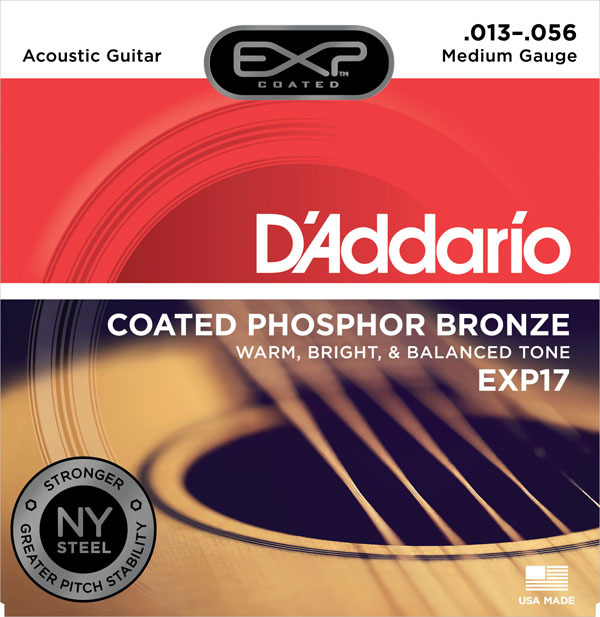 This set in particular, the EXP10, is a great example of why D’Addario strings have been the strings of choice for musicians all over the country. The set is made from 80/20 bronze, which is known for its bright tone. The set’s gauge also works towards enhancing its brightness. So while these strings are coated, it’s still going to be a very bright sounding set of strings overall. 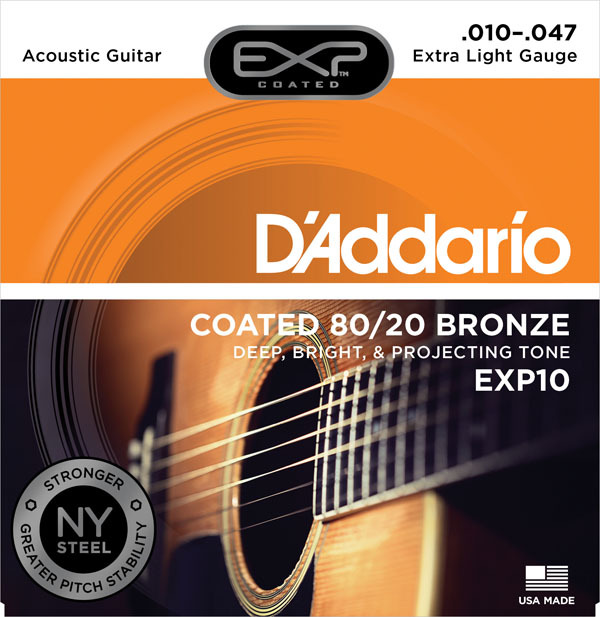 The EXP10 set also uses D’Addario’s patented NY steel. This steel was created with the intention of producing strings that are more durable and stable than traditional guitar strings, and by all accounts the company has succeeded with this. Like any other set of light gauge strings, the EXP10s are going to perform very well in genres that require complicated fingerings or fast passages. 95 out of 100. Incorporating 400+ ratings and reviews. The Elixir Strings Nanoweb Phosphor Bronze Medium set has the same specifications as the set above, but the strings’ gauge is thicker. The same rules apply here that apply to any other change in string gauge. The medium set of these strings is going to be a bit louder and sound warmer than the custom light set, though they will be harder to play. When you get to medium gauge acoustic guitar strings you start to get to the point where playability is going to become more limited. If you’re a fingerpicker this gauge might not be the best fit for you, especially if you play a guitar with a long scale length. Medium gauge strings can be hard to bend and barre, so if you’re not used to playing on them they’re going to be a bit uncomfortable until you start to adjust to them. That’s not a flaw with the this set in particular, it’s just something to be aware of if you’re planning on switching to this string size. 96 out of 100. Incorporating 800+ ratings and reviews. 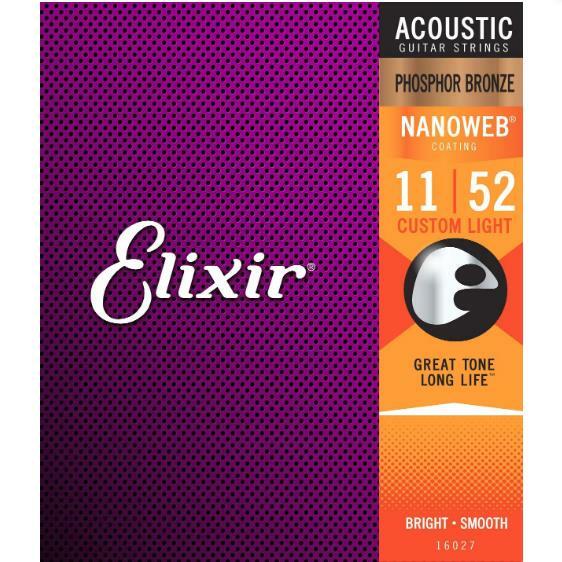 The Elixir Nanoweb Phosphor Bronze Custom Light set is great if you’re looking for a combination of playability and warmth. The cool thing about this set is that it delivers the playability of a thinner gauge of string, but because of the impact the coating has on the strings’ tone it’s still a really warm sounding set. The Nanoweb coating used on these strings also helps to retain some brightness, unlike the Polyweb coating which leans more towards the warm side of the spectrum. There isn’t really a genre these strings can’t do, though if you’re looking for a bluegrass tone you’re likely going to be happier with an 80/20 set. With that being said, if you’re doing jazz, fingerstyle, or more mellow genres you’re likely going to get pretty good results with this set of strings. 94 out of 100. Incorporating 1250+ ratings and reviews. Elixir was the company that pioneered coated strings, and they still make a product competitive with any other on the market. Their strings are so well received that they’re the string of choice for Taylor guitars, which is why when you see a Taylor at a music store chances are that it’s strung with Elixirs. This set is made from phosphor bronze, which gives it a very warm and full tone. Its warmth is enhanced by the coating used by Elixir. The gauge also works towards the sets warmth, because even though the packaging says “light” .012 size strings are still pretty warm sounding. These strings will perform very well in just about any genre. Though, because the set is a bit on the thicker side it might be hard to use this set to play fast lead passages or complex fingerstyle songs. This is a matter of personal preference however, so your experience may vary. There’s a lot that goes into guitar strings, acoustic guitar strings especially. You have to have an understanding of how gauge and materials interact with your guitar to create your tone, and how to balance that with the playability you’re looking for. If you’re not really sure how all of these factors work, check out the sections below! In this article we’ve collected single sets of strings, but in most of cases these strings will be available in larger packs. When you buy larger packs you save a few bucks per set, with your savings increasing the more sets that are in the pack. Most manufacturers sell three-set-packs, though some (with Ernie Ball being a notable example) produce packs with 10 sets of strings. You don’t have to worry about your strings going bad while they’re in the package, because strings aren’t aged rapidly through oxidation (they’ll age a bit if they stay in the package, but it’d take years before it was really noticeable). The main thing that will damage your strings are the oils on your fingers. As you’ve probably noticed, manufacturers include words like “light, medium, and heavy” when they talk about their strings. This is referring to the gauge of the strings, or how thick they are. Thicker strings are harder to press down and have a warmer sound, while thinner strings are easier to press down and have a brighter tone. Thicker strings are louder and perform better when strummed, while thinner strings are quieter and have a higher tendency to break when strummed forcefully. Below is a rough estimate for different gauges, including: extra-light, custom light, light, medium, and heavy. The sizes will be organized from thinnest to thickest. One thing to keep in mind is that companies occasionally label the gauge of their strings relative to each other, so strings that one brand calls light another brand may call extra-light. Because of this, there’s some variance in what some brands classify different gauges as. Below are the materials most commonly used in acoustic guitar strings. Different materials are used occasionally, but the four listed below encompass the vast majority of what you’re going to encounter. Without getting too far into the technicalities, phosphor bronze is a bronze alloy (a combination of metals) commonly used for guitar strings. The strings give a balanced tone with a warm low-end and a strong mid-range presence. 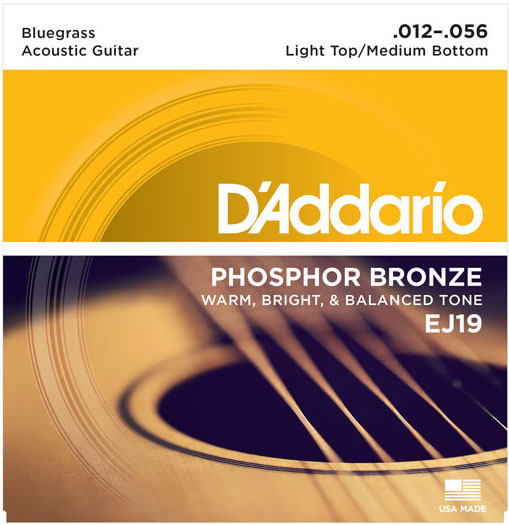 Phosphor bronze is the most commonly found string, which makes sense because they’re arguably the most versatile. There isn’t really a genre that these strings don’t perform well in, though 80/20 or silk and steel strings may be a better fit depending on your preferences. 80/20 bronze, which is also commonly called brass, is a lot brighter sounding than phosphor bronze. It has less of a bass presence, so your guitar will cut through a mix (be heard better in a band) better than it would if you were using phosphor bronze strings. Our only word of caution is that if you play a guitar which already sounds bright 80/20 strings might not be the best fit for you. 80/20 strings can make some guitars sound thin, smaller guitars especially so. However, dreadnought sized instruments (if you’re not sure what this is, Google “dreadnought guitar”) usually don’t suffer from this. Silk and steel strings are steel acoustic guitar strings which are essentially the middle ground between a standard acoustic guitar string and a nylon string. They’re composed of three layers: a silver-plated bronze (or tin) alloy for the outer winding, a layer of nylon in the middle, and a thin wire in the center. Silk and steel strings have a much more mellow tone than either phosphor bronze or 80/20. Because of their construction, they’re also significantly easier to fret because it takes less pressure to push down the strings. This is part of the reason why they’re popular with fingerstyle and folk guitarists. Unfortunately, they are not quite as loud as phosphor bronze or 80/20 strings. When you hear people talk about “coated strings”, they’re talking about strings that are coated with a plastic-based polymer. This coating helps to increase the longevity of the strings. However, coated strings are also more expensive; generally twice the price of non-coated strings. As a rough estimate (this is my personal experience, your experience may vary) they last twice as long, so you may not really be saving anything by going with coated strings. However, you also won’t have to change your strings quite as often. The coating used on strings also change the tone. They generally cause a roll-off in the high-end response, so your strings sound darker than they otherwise would. In some cases this actually works out pretty good, as coated strings can tame the high-end in guitars that are too bright. Likewise, coated strings may not be the best choice for guitars that are darkly voiced. Though of course, this is all a matter of personal preference. Because you can’t tweak your tone on an acoustic guitar to the extent that you can on an electric guitar, your choice in string is going to be a key element in your tone and the response of your instrument. It’s also a balancing act, because you have to weigh the tone you want against the tone of your guitar and how you play. So the first question is: What do you play? If you’re a strummer, you may find that heavier strings work to your favor. You’ll get more volume and a warmer tone, which is great for accompanying vocals. If you play lead, you may find that medium gauge strings are the best combination of playability and volume. Finally, finger stylists generally prefer lighter gauge strings. The techniques used in the genre require more complex fretting, which can make higher gauges unmanageable. So, what about materials? Well, generally the livelier the genre you’re playing the brighter strings you’re going to want. So if you’re playing bluegrass for example, you may want to look at 80/20 bronze strings. On the other hand, if you play more mellow music you’ll get good results with phosphor bronze. While your choice of string is going to vary based on how you play, your taste (which will change over time), and your guitar, here’s a quick reference table if you’re still not sure which type of string is going to work best for you. There are well over 1,000 different bundles of acoustic string sets available to buy online just in the USA, let alone the rest of the world. This simple fact made this the most challenging topic we have investigated in detail to date. In order to tame the massive amount of data involved, we used a tight statistical sampling approach where we only short-listed string sets with very high ratings at a select group of leading online American retailers and only those with a comparatively large number of rating sources. This resulted in a manageable short-list representative of the most popular brands - some highly regarded but lesser known brands were therefore not included. Our short-list included 56 string sets with a total of more than 19,000 rating sources from the following 11 brands: D'addario, Dean Markley, DR, Elixir, Ernie Ball, Fender, GHS, Gibson, John Pearse, Martin and Vibe Strings - you can see most of these sets in the Music Gear Database. We then collected those 19,000+ rating sources from online retailers, forums, videos, blogs and major gear review websites, and then analyzed those data with the Gearank Algorithm to produce a Gearank score out of 100 for each string set. Only the very highest rated string sets were selected for recommendation, and further analysis, in the list above. For more information about this process see How Gearank Works. Submitted by vlado (not verified) on Apr. 9, 2018. This article is about best known strings or the best acoustic guitar strings? Thomastik Infeld strings anyone? As mentioned in the Best Acoustic Guitar Strings Selection Methodology section above we only put a set of strings on our short-list if they had both high ratings and a large number of ratings - so popularity did play much more of a role than it usually does in our guides. Thomastik have made it onto short-lists for other types of strings and we have recommended them in our guide to The Best Bass Strings.